In honor of Earth Day, anything green is good. But with many eco-friendly clothes and bags in circulation, it is about time shoemakers joined the trend. Designers have come out with cute, comfortable and very fashionable shoes that help, not harm, the environment. Hetty Rose shoes are handmade, gorgeous shoes with a feminine touch. The best part is that they are environmentally friendly! These shoes are made by re-using and re-working vintage materials in a creative and sustainable way. 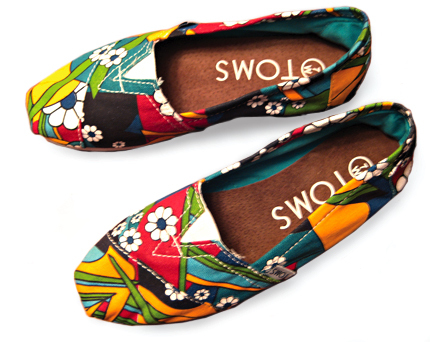 The primary materials used to make these colorful shoes are vintage Japanese kimono fabrics. Every shoe is constructed with these lush antique fabrics and eco-sensitive vegetable tanned leather. This vegan footwear line has an international following that attracts people like Natalie Portman with its pretty and classic collections. Beyond Skin shoes are made with man made materials like smooth satins and soft faux suedes. The synthetic leathers are made from a cotton-backed polyurethane (PU) which is a kinder alternative to both PVC and farming/tanning leather. Beyond Skin donates a percentage of its profits to a collection of ethical charities. Not only are these shoes eco-friendly, but they are super cute and VERY comfortable. TOMS Shoes carries flats in all different types and colors, including vegan shoes. The vegan shoes are made with recycled texture twill and have recycled rubber blend sole. This California-based company is not only helpful to the environment, but also to children without shoes. For every pair of shoes bought, a pair is given to a child in need. Now you can be both fashionable and green from head to toe!